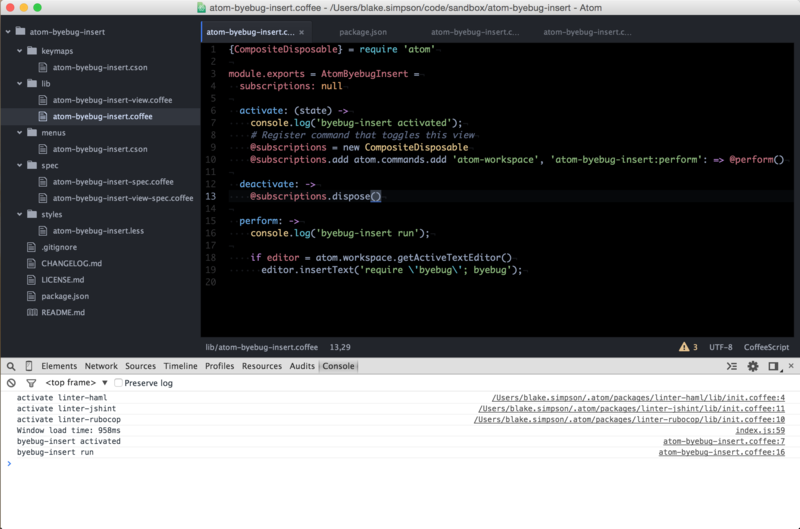 Today I started working with the awesome Atom Editor instead of my usual tool MacVim. Atom is open source and free, produced by the people at GitHub. To introduce Atom, what can I say that they can't say for themselves? So basically Atom is a code editor built on top of a browser. Meaning, as a web developer you already have all the skills needed to extend the code base, or write a custom Atom package (plugin). Due to Atom being based on a browser engine (Blink) you even have the usual Chrome developer tools available to you! As in Vim, similar motions are available for words as well as lines. There are also built in commands to jump to files or between tabs, no plugins required. And even more default combinations inspired by Vim. These extensions can be installed from the Settings section of Atom or from the terminal using the Atom Package Manager (apm), apm install awesome-package. This package allows you to hold Alt while making a selection to select blocks of text, in the same manner as Vim visual block mode, or the column selection in Sublime. This is similar to Supertab in Vim. While typing the editor will scan the open buffer for words matching what you are typing and offer a suggestion. Simply hit tab to autocomplete the word. Once you have this installed, you can install autocomplete-html and autocomplete-css to make writing your markup a breeze. This is specific to the Ruby world. html2haml allows me to select HTML content and automatically convert it to HAML syntax. Syntax highlighting for HAML. There are many other "language" packages for other syntaxes too. Most of the above packages have been written and contributed by the Atom community. I found that writing my own was actually easy, as you are given a scaffold project which can quickly be modified. Once you've written a package, it can be published to the Atom Package index, simply publish with apm publish my-package. One of the other great features of Atom is the search. Atom can search within a tab, within a project, through open tabs, or for methods within a file too. The search interface feels very intuitive, especially if you have used Sublime before. There are options to search using regex patterns, limit to your visual selection, and to match case. Atom even comes built as a Markdown editor by default, which suits me perfectly. Right now I am writing this article with a live markdown preview, updating as I type (⌘-⇧-M to activate). Atom comes built with spell checking built in too, making the editing process feel seamless. 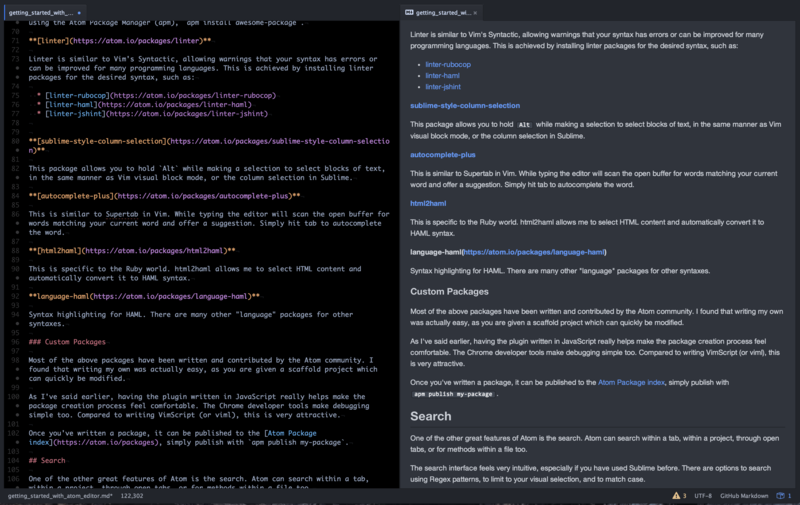 I have only been working with Atom for one day but I already feel comfortable with it. All of the core functionality I need to be productive is at my fingertips and I have quickly found many packages to fill any gaps in the default features, even writing my own package for a feature I could not find. Although I am still referring to the cheatsheet at the moment, I look forward to getting even more comfortable with Atom and hopefully have it take over as my primary code editor in the near future. I'll still love Vim for quick file editing and when I'm working on a Unix server but for project work I'm excited to use a code editor that is fresher and simpler than what I'm currently used to. I now just need to learn to stop typing :w!